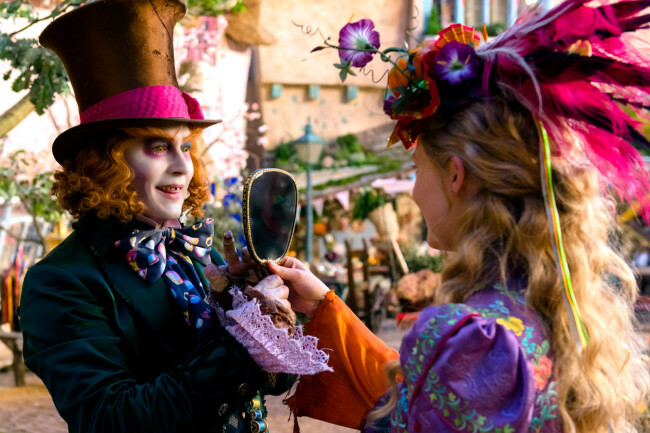 Alice Through the Looking Glass is a shiny and nicely packaged Disney film made for kids, but it’s not Lewis Carroll’s vision and that’s too bad. Okay, so Carroll’s vision was mostly opium induced. But his literary nonsense gave us the bizarre and fantastic Alice books which were nothing like the sober and structured storytelling, that we got with Tim Burton’s Alice in Wonderland, and now James Bobin’s Alice Through the Looking Glass. 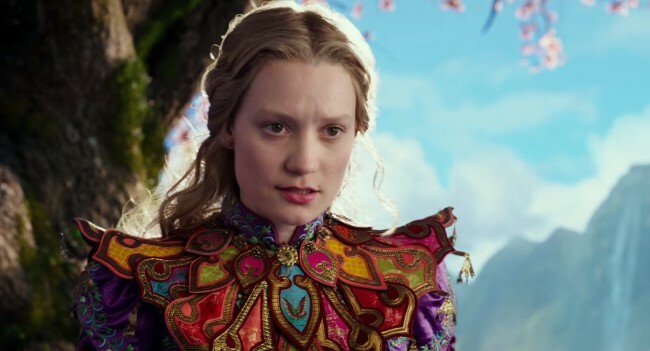 In this sequel, Alice Kingsleigh (Mia Wasikowska) is a captain of her later father’s merchant ship. After spending her time out at sea, “doing the impossible,” she returns to London. She also tries to save the family business, and pitch a new ocean exploration idea to her former suitor, and now boss, Hamish Ascot (Leo Bill). However, she’s told by him that she’ll no longer be the captain of her ship and instead is encouraged to take a desk job. Okay, I just need to take a moment here and say that I’m all for empowering women, but when things get really preachy and over-the-top, it takes away from the story. There was no need to force feed women’s rights into this film as it feels out of place. There. I said it. Alice finds a looking glass (mirror) and goes back to Underland or Wonderland, whatever you want to call it, to help the Mad Hatter (Johnny Depp) who is going, mad. Apparently he believes that his family is still alive after their village was wiped out by that fire spewing Jabberwocky. Of course the rest of the gang is all there, but mostly on the fringes as cameos, with Tweedledee/Tweedledum (Matt Lucas), the White Rabbit (Michael Sheen), the Cheshire Cat (Stephen Fry) and the White Queen (Anne Hathaway). I also want to mention that the late, great Alan Rickman voices the caterpillar-turned-butterfly Absolem in his final performance on film. Sad. The movie was dedicated to him. Speaking of sadness, The Hatter is dying due to melancholy, so what does Alice need to do? She must go back in time (cue the Huey Lewis music) and save the Hatter’s family from being pan fried. Instead of a DeLorean, she must steal a time machine device called the Chronosphere, a metallic globe inside the chamber of the Grand Clock, from Time himself, played by the fantastic Sacha Baron Cohen. This is where the story is supposed to really take off, but it never really goes anywhere. Just like Lewis Carroll writes in Through the Looking Glass novel, “My dear, here we must run as fast as we can, just to stay in the same place.” That perfectly best describes this film. As beautiful as this movie is to look at, it’s a complete bore to watch. Johnny Depp’s wooden apology to Australia for his dogs, was more interesting than this. And easier to watch. We’re supposed to like this character, but there is really nothing to get attached to. I’m not sure if Depp is lost in the character or the character is lost in Depp, maybe that’s something Carroll would have written. 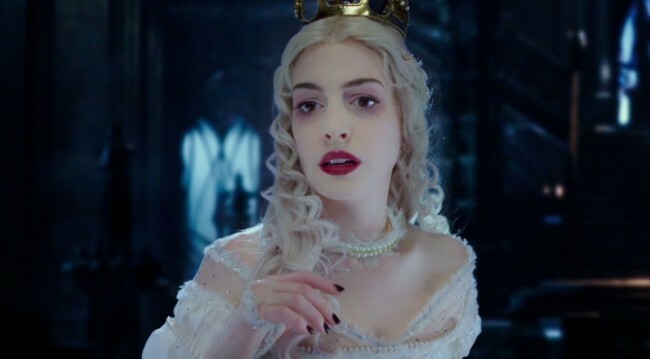 That said, Depp’s performance was not nearly as annoying as Anne Hathaway reprising her role as the White Queen. She spends most of the film waving her hands around and being completely useless. Honestly, her flailing of hands is a distraction and I was hoping for a “Off with her head!” moment. Or at least her hands? Most of the film is focused on Alice jumping around in time and showing us a young Hatter and a family that looked nothing like him. Seriously, is he adopted? Why did he get the freakish genetics? We also get the origin story of the Red Queen (Helena Bonham Carter). All I will say is how does a life of evil start with someone lying about cookies? Honestly? 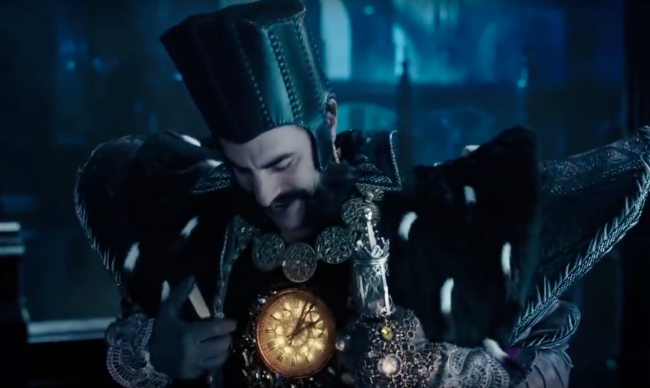 The only redeeming performance in this film is Sacha Baron Cohen as Time, and it makes you wonder what might have been were he cast as the Mad Hatter. He brings some comic relief to a film where you could probably go relieve yourself in the bathroom and not miss a second, minute or hour. Why? Time. Many critics have slayed this Jabberwocky of a film, and I’m not going to give it a massively positive review either. But hear me out for a second, because I do have a responsibility to tell you this: as much as critics are going to hate the plodding story, kids might actually like all the prettiness and the predictability. It’s the simple things in life. 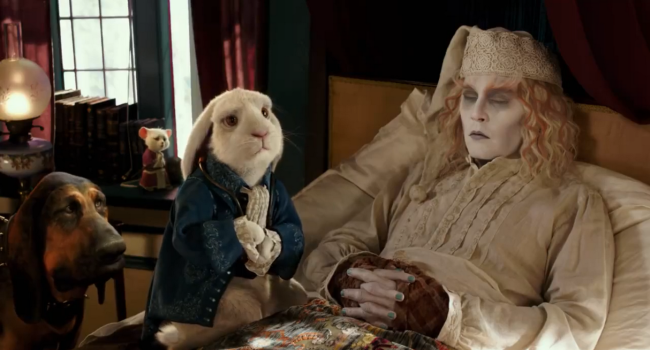 I didn’t hate 2010’s Alice in Wonderland as much as others did. Quite frankly I enjoyed watching it with my daughter, who has watched it so many times since that I probably do now hate it. I grew up on the 1985 Alice in Wonderland TV miniseries, which at the time, was fabulous and kind of scary. I thought the 2010 version was gorgeous to look at just like this sequel, with the only difference being it had a pinch of magic. Unfortunately in this newest offering they forgot to add Carroll’s enchantment to the story. 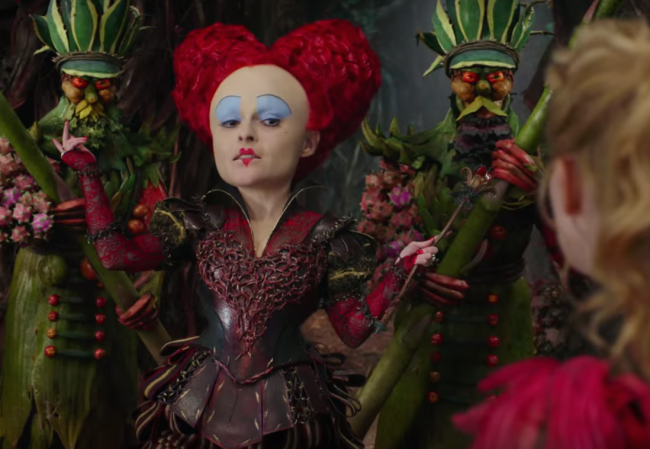 Alice Through the Looking Glass takes the CGI and turns it to 11. That’s one more than 10. It’s actually pretty incredible from the costumes to the set, to how much everything pops while wearing the 3D glasses. So although critics are going to feed this film some haterade, if your kids want to see this, take them and see it on the big screen. Disney has been on fire lately, but with Alice Through the Looking Glass they took a pile of money, poured gasoline on it and burned it. They have officially killed Alice and the entire Wonderland universe. Try and read the books to your older kids, or at least show them the Disney animated film. Because the only think that will make this newest adaptation enjoyable is opium.